Radish, Catnip, Broccoli, Tansy, Dill and Marigold. Sow seeds 1 inch deep in late spring or early summer, either in rows or hills. Also may be started from seedlings started indoors or purchased at stores. Most gourds grow into large, long-vined plants. Growing long gourds on a trellis helps them keep their shape. Grow at the edge of your garden to save space. Harvest gourds as late as possible, because gourds will not cure and store unless they are totally ripe. 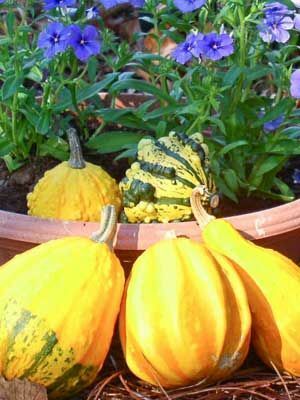 Cut gourds with a bit of stem attached, and move to a dry place to cure through winter. Squash bugs and squash vine borers can be serious pests. Exclude them from young plantings with row covers. Some gourds such as luffas rarely fruit well in northern latitudes.